Marinating chicken is a simple way to tenderize the bird and infuse the meat with a burst of flavor. Using curry in your marinade adds a bit of heat and Indian flair to the chicken. 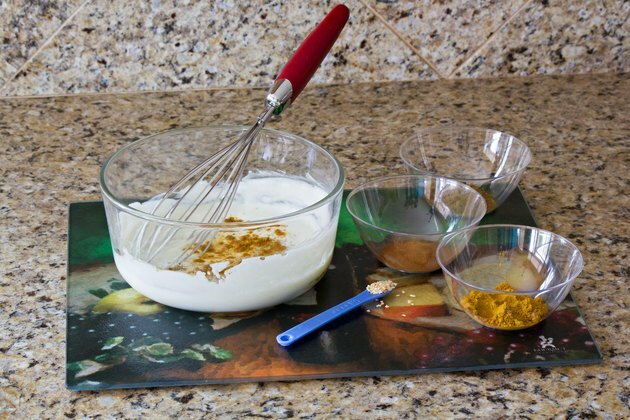 In as much time as it takes to whisk your ingredients together, you'll have a rich marinade that will do all the work of flavoring and seasoning your chicken. The beauty of a curry marinade is that you can include whatever spices and herbs you wish, as long as you include basic curry powder, too, according to Pat Chapman, author of "Curry Magic." 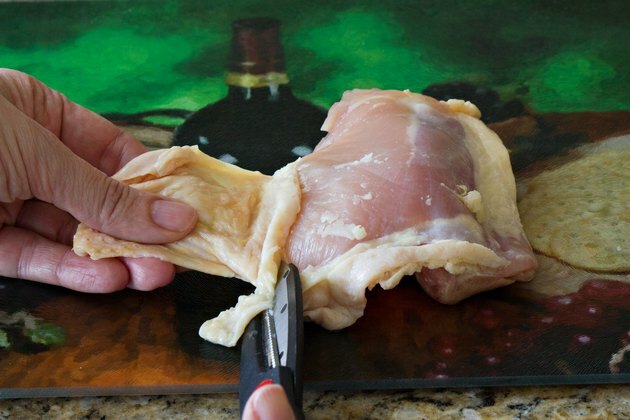 Remove the skin from each piece of chicken, if necessary. Taking the skin off the chicken is common in Indian cooking, but it also significantly reduces the fat and calorie content of your curry meal. Place the chicken pieces in a shallow dish or a large zip-top plastic storage bag. Set the chicken aside. 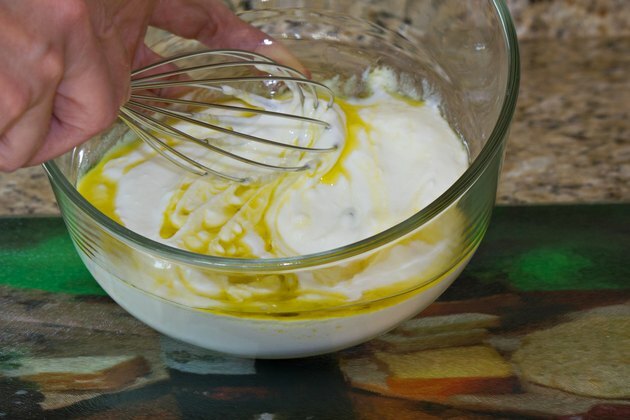 Scoop plain yogurt into a bowl and whisk in a generous drizzle of cooking oil such as olive oil, which is a heart-healthy choice rich in unsaturated fats. 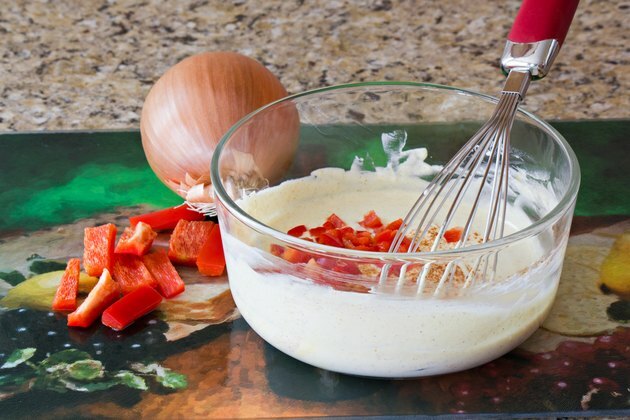 Opt for low-fat plain yogurt to cut the fat content of the marinade. The finished product should be thick, but liquid enough to pour. Whisk in curry powder to taste, and any other dried herbs and spices you enjoy. Cardamom, cumin, coriander, cinnamon, black pepper, ginger, garlic and celery seed are examples of seasonings that will pair well with the curry powder. Add additional ingredients according to your tastes. For a bolder flavor, whisk in garlic paste or ginger paste. For a more mild flavor, add diced onions and peppers to the marinade. Bell peppers will add a slightly sweet flavor while spicy peppers will add a bit of heat to the marinade. 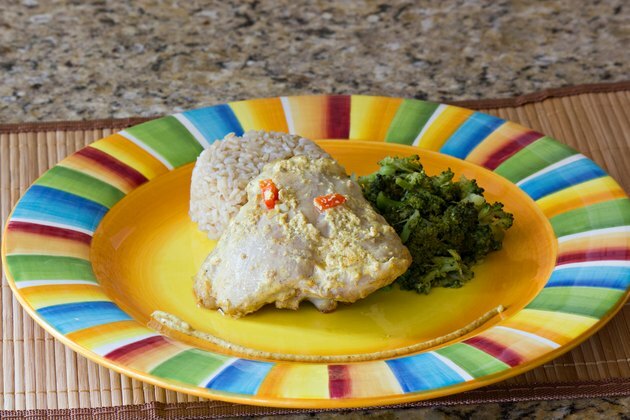 Fresh ginger root, parsley and chili powder are additional ingredients that will enhance the flavor of the marinade. 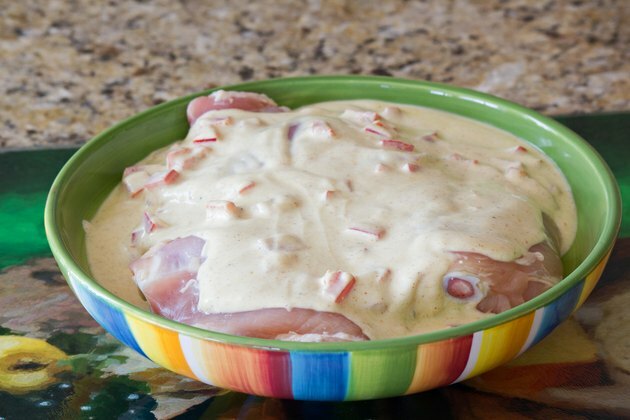 Pour the marinade over the chicken and let the meat marinate for several hours or overnight before cooking it. Remove the chicken from the marinade and place it in a roasting pan that has been sprayed with nonstick cooking spray. Roast the bird until it's cooked through. Serve the chicken with high-fiber side dishes such as boiled lentils, steamed brown rice or whole-wheat pita bread with hummus. Many curry recipes call for the marinated chicken to be fried. Roasting, however, is a healthier alternative because the finished product is lower in fat and calories. Cook your chicken thoroughly. Undercooked chicken can be contaminated with germs or bacteria, such as salmonella, that can make you sick if you ingest it. Don't use the leftover marinade as a sauce for the cooked chicken. 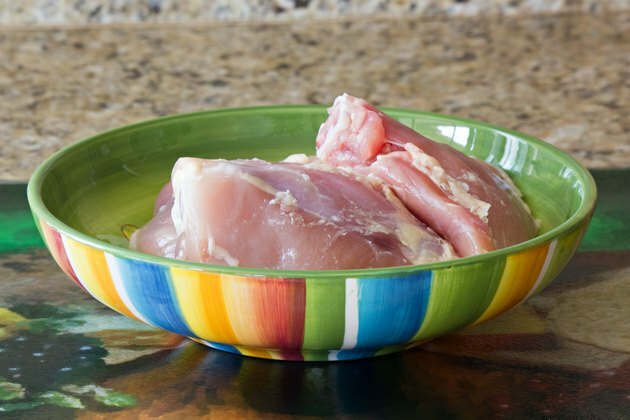 Because the raw chicken came into contact with the marinade, it can harbor bacteria or germs that could make you sick.